I came across a piece on the Irish Catholic on depression and suicide. 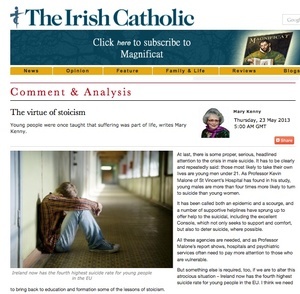 Mary Kenny calls for lesson in stoicism in young people, which she describes as: “the Greek philosophy of enduring suffering bravely and without complaint.” – needless to say, this flies in the face of all the campaigning and work done to encourage young people to talk, reach out and get the help they need. Posted in Misc and tagged Depression, suicide at 11:57 am on May 26, 2013 by Broadsheet.